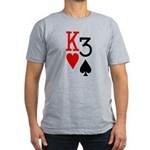 This is the King Three Off Suit Poker Shirt. Also known as King Crab and is truly unique because PokerESQ Poker Shirts makes custom poker shirts for men and women. All you have to do is ask us to make your custom shirt by using the suggestion box. The shirts will be added to the site within 24 hours and there is no additional set up fees or design fees! Feel free to browse all of our designs or click the image on the left to buy your custom poker shirt.